Stewart Edward White (1873-1946) was a very popular American writer in the early decades of the 20th Century. Only one of his books made the Publishers' Weekly list of ten bestselling novels of its year: The Silent Places was 10th in 1904; but he was generally successful. He was a friend of Theodore Roosevelt's, who admired both his literary prowess and his shooting. White was an avid outdoorsman, a hunter, camper, and canoer. Most of his books (fiction as well as travel) were set in the American West, in the wilderness, and were packed with detail based on his own experience or his interviews with fur traders and the like. 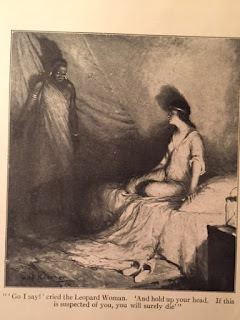 Then, around 1920, his wife Betty began to (she said) receive messages from spirits; and the two published a number of books about those messages until Betty died in 1939. White then claimed to have received further messages from Betty in the afterlife, and wrote at least one more book based on them. In the context of most of his oeuvre, then, The Leopard Woman is an outlier. It is set in Central Africa, in the early days of World War I. It does still reflect his interest in hunting and his knowledged of the subject. It is also, not surprisingly, quite racist in its depiction of the natives of Central Africa. The view expressed in this book is not vicious, nor hostile, but rather extremely condescending. There's really no getting around that -- and there's little doubt the view of African tribesman as portrayed here is quite consistent with that of the general American (and European) public at that time -- but it remains distasteful to contemporary sensibilities. 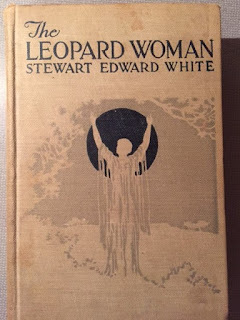 The Leopard Woman was published by Doubleday, Page & Company in 1916. It is illustrated, rather nicely, by W. H. D. Koerner. My copy appears to be a First Edition, in good condition, no dust jacket. It was made into a silent film in 1920, starring Louise Glaum and House Peters. There are apparently letters between Gary Cooper and Ernest Hemingway discussing a possible talking version that would have been scripted by Hemingway and starred Cooper, but obviously that came to naught. The novel opens with a safari on the march. The leader is an Englishman named Culbertson, but called Kingozi. We learn of the structure and discipline of the safari team: his trusted delegates, Cazi Moto and Simba, Culbertson's reputation as a very knowledgeable man and a great shot. Soon they unexpectedly encounter another safari, and Kingozi forms a low opinion of this group -- it seems less disciplined, and it's hard to understand what they are doing. To his surpise, he learns that it is led, if somewhat incompetently, by a European woman, who is called "the Leopard Woman". Out of a sense of both obligation and curiousity, Kingozi ends up joining the other safari -- it's clear they don't know where to find water properly, etc. And he is soon somewhat bewitched by the very beautiful Leopard Woman. But he has a responsibility -- not quite clear to us -- and he remains tied to that, even as he is tempted to make love to the Leopard Woman (especially when she arranges a scene where she displays herself in a light shift with the moon behind her -- apparently Kingozi can barely resist such a sight). There follow some adventures -- a charging rhinoceros, for instance -- and some intrigue, as Kingozi and the Leopard Woman, who are clearly at some sort of cross purposes, jockey for control of the travel sequence. When it becomes clear that Kingozi will prevail, and continue his journey to meet a great and influential chief, the Leopard Woman has one of her lackeys attempt to murder him. He escapes, but one of his men is killed, and continues -- when he is suddenly struck blind. To make things worse, when he asks the Leopard Woman to identify the medicine he happens to carry that will cure him, she refuses -- and indeed breaks the vial. But Kingozi perseveres, well aware that his rival, the German Winkleman, is also making his way to meet this chief -- and alliance may be important to the progress of the War. Fortunately, Kingozi has assigned a couple of his most trusted men to use a magic bone (a fossil) to distract Winkleman (who is a scientist). There are a couple of tiny twists to come, but the conclusion is mostly straightforward, culminating, of course, in a resolution of the relationship between Kingozi and the Leopard Woman -- or, that is, Culbertson and the Countess Miklos. It's not a great book, but it is pretty entertaining on balance. And White's descriptions of the safari, and the techniques behind the march and the camp and the hunt, and of the Central African landscape, really ring true. White tells all this in a very knowing tone -- and as I know nothing of the subject I trust that he got it right. (He did write at least one straightforward travel book about Africa.) I don't know that this book will ever really be revived, but, except for its casual (though not hostile) racism (which may indeed, and understandably, be sufficient bar to enjoyment for many readers), it's not a bad adventure novel. Nicholas Monsarrat (1910-1979) was an English writer and also a Lieutenant Commander in the Royal Navy, who served with distinction in the Second World War, and was later a diplomat. He wrote his first novels in the '30s, but become much better known for his sea stories, beginning during the War. He became a full time writer in 1959. Several of his novels were well-regarded at the time, but only The Cruel Sea seems much remembered any more. 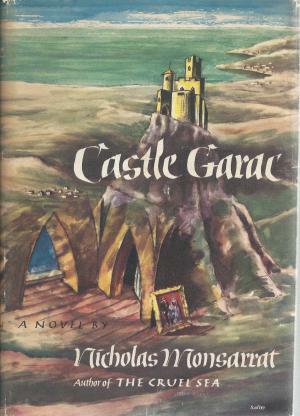 Castle Garac dates to 1955. My copy is an American first, from Knopf. Though the book didn't seem to be reviewed well, it had a Book of the Month Club edition and numerous later paperbacks, so it probably sold OK. It looked interesting to me as potentially in Alastair MacLean territory -- and it brushes against that -- but from another angle it has Gothic aspects, though it's told from the POV of the male lead. Comparing the original hardcover dust jacket with a later paperback shows the paperback marketers chose to emphasize -- indeed, greatly exaggerate -- the gothic aspects. The novel opens with said male lead, Tom Welles, in Nice, France. He's a youngish ex-journalist, who moved to France to write his first novel. The novel is finished, and he's sent it to his agent, and he waits every day for a response. Meanwhile he's almost out of money. One breakfast he decides to steal a roll of bread from another diner, who seems ready to leave the bread. Suddenly the man (who is named Ehrenhardt) returns, and engages Tom in conversation -- but not because he noticed the theft. He wants to offer him a job. The job involves looking for a castle in the area, potentially, it seems, to shoot a film of some sort. The castle found, the next task will be to find an appropriate young woman, Tom supposes perhaps to star in the picture. If that's what it is. The job also involves interacting with Mr. Ehrenhardt's beautiful wife, who makes a point of repeatedly attempting to seduce Tom. All this goes along well enough -- Tom has enough money to survive, and rather more, after Mrs. Ehrenhardt stakes him some money at a casino, and insists Tom keep half the rather unexpected winning he realizes. But Tom feels a bit uneasy -- there is something funny about the Ehrenhardts. Finding an appropriate castle turns out not to be too difficult, but finding just the right woman is much harder. Tom is all but ready to give up, and gets drunk in despair, when he chance meets a girl in a park, tending a child. He gathers she is a nanny for an American couple, and that also she is an orphan -- an important detail to the Ehrenhardts. He decides he must offer her the job -- it could mean some money for her. But then he decides (surprise! surprise!) that he is falling in love with her (her name is Angele), and he regrets introducing her to the now very sinister seeming Ehrenhardts. But Angèle disappears, as do the Ehrenhardts, leaving Tom a note informing him that his services are no longer required. Oh, and Tom gets a letter from his agent -- it seems that not only has his novel sold, a movie producer is interested. Tom will be well off -- able to support a wife. But the girl he loves is gone! Naturally Tom figures she might be at the castle (though the Ehrenhardts claim to have abandoned their plans for it). 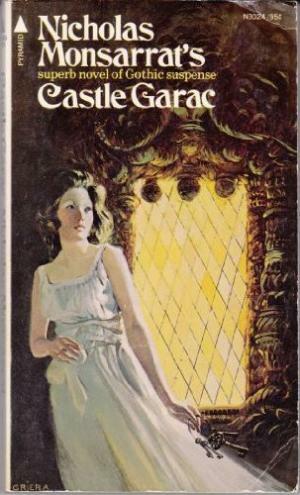 And what follows is the gothic part -- mysterious castle, girl in distress (though not really that much, it turns out! ), gypsies, a mysterious stranger, and a tangle story of a rich French noble family who were all killed by Nazis ... or were they? I thought there was some promise to all this, but the book ends up, in my view, a couple of twists, and a couple action scenes, short of the proper thriller/gothic requirements. And the Ehrenhardts, though a bit shady, are not really dangerous or violent -- and the whole scheme is not really all that sinister or dangerous. And it ends up failing for a reason out of left field. I was all unconvinced by Tom's good fortune as a first novelist -- the view of the writing life was almost as unrealistic as that on the newspaper comic Funky Winkerbean (Les Moore is one of the stupidest portrayals of a so-called writer I have ever seen). I did like the romance between Tom and Angele, though more or less by default. All in all, this is a very slight novel, and frankly well worth being forgotten. 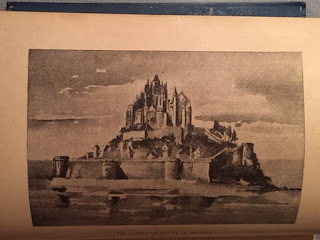 It seems perhaps Monsarrat was trying something different from his sea story niche (and from his earlier novels, which were realistic social novels, apparently) -- and good for him for trying, but it doesn't really work. Here's another fairly obscure Ace Double, distinguished mostly by the presence of one of SF's Old Masters: Murray Leinster, called the Dean of Science Fiction. "Murray Leinster" was a pen name for William Fitzgerald Jenkins (1896-1975). Jenkins was a true professional writer, working in numerous fields. His first story appeared in H. L. Mencken's The Smart Set in 1916, when he was only 19. His first SF story, "The Runaway Skyscraper", appeared in Argosy in 1919. He wrote regularly for Astounding and Analog, beginning in 1930, with his last appearance in Analog coming in 1966. (He retired from writing at about that time: his last non tie-in novel appeared in 1967, his last short story in 1968.) Most of his SF was as by "Murray Leinster", though some was as by "William Fitzgerald" and a few as by "Will F. Jenkins". His romance novels were as by Louisa Carter Lee, and his Westerns and Mysteries as "Will F. Jenkins". He also wrote for radio, television, and the movies. And he was an inventor, most notably of the front projection system used in special effects composite photography. He also won the Hugo for Best Novelette in 1955 for "Exploration Team". In all, quite a remarkable career. The other writer in this pair, Philip E. High, had a reasonably interesting career himself. He lived from 1914 to 2006. His primary job was as a bus driver. He wrote 14 novels and a number of short stories, mostly for British publications, between 1955 and about 1980, with a number of additional short stories showing up in later years, in publications devoted to venerable UK SF writers. 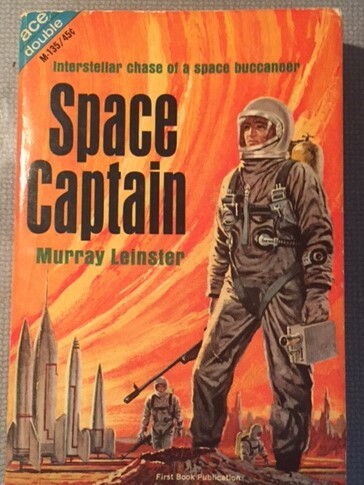 Murray Leinster, to me, was in his latter years a dependable producer of enjoyable but undistinguished SF, mostly somewhat adventure-oriented. That said, he wrote some truly significant stories earlier in his career, most notably "Sidewise in Time", an influential alternate history story; "A Logic Named Joe", which famously foreshadowed something like the Internet; and "First Contact". The novel at hand, Space Captain, fits in the "enjoyable but undistinguished" category. 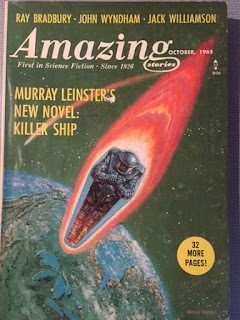 It was first published in the October and December issues of Amazing, the second and third to be published by Sol Cohen and edited by Joseph Ross (after Ziff-Davis sold Amazing and Fantastic, and Cele Lalli stayed with Ziff_Davis (wisely, no doubt).) Thus I wonder if the story was bought by Lalli or by Ross -- I suspect the latter (though I suspect as well that possibly such stories as Cordwainer Smith's "On the Sand Planet" (December) and the Robert Young and Keith Laumer stories from August were Lalli acquisitions). The serial version was called "Killer Ship", and Amazing, as was their habit, acknowledged the forthcoming book version, and its new title. The copyright page for Space Captain claims that the magazine version was shorter, but I made a cursory comparison of the two versions and I think the serial was actually a bit longer. The differences are mostly rather minor editorial changes, with a few extra sentences here and there. The protagonist is a certain Captain Trent. Much is made of his ancestry -- he is descended from a series of English ship captains (as well as some spaceship captains and explorers), and many of his actions in this book are compared to his ancestors' heroism with sailing ships. Trent is hired by a group of merchants who have been losing money because of the activities of a group of pirates in a rather isolated area of the Galaxy. His new ship, the Yarrow, will be augmented by a special weapon, which will be controlled by its inventor, an engineer named McHinney. But, Trent tells the merchants, he doesn't hold with gadgets. Nonetheless, he is compelled to take McHinney and his new weapon. The rest of the novel, then, is a somewhat episodic account of Trent's various encounters with the pirates -- usually preceded by the spectacular failure of McHinney's weapon, after which Trent does things the way he wanted too. In one case he rescues the daughter of an influential politician, and he starts to feel responsible for her. And she seems quite interested in him. That changes Trent's emotional involvement when the politician, assuming the pirate problem has been solved, lets his daughter travel again. So Trent (all along claiming to be a gruff unsentimental ship captain) heads out on a final mission to finally take on the pirates at their planetary base, and once and for all eliminate them. It's all, well, what you expect. The love story is perfunctory, really, but it has its cute aspects. The science doesn't really bear close inspection. The plot details, and the battles, are pretty implausible. Certainly this is not Leinster at anything close to his best. He's enough of a pro that I still kind of enjoyed the story -- but it's pretty minor work, no doubt. 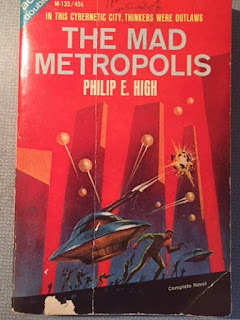 Philip E. High's stories had a tendency to be very weird, and to be a bit shoddily constructed. I think that applies to The Mad Metropolis. It opens with Stephen Cook, a Prole in an overcrowded future, being pushed out of his home building to the street. Streets, it seems, are near certain death for the unprepared, and Cook, in terror, is nearly a plaything of an upper class woman ready to torment him with psychic weapons -- until he is rescued by the Metropolis' private police force, the Nonpol. He is soon released, with almost no money, after an investigation hints that his intelligence is higher than a Prole's should be. Things spiral from there, in a somewhat Van Vogtian fashion. We soon learn that Stephen Cook is a superman whose intelligence has been artificially restrained. Cook is soon involved in a multi-sided battle for the fate of the world. It involves Mayor Tearling of his home city, and other politicians just trying to maintain the status quo, as one side; the Nonpols as another side; a group of super intelligent people called Oracles; and, perhaps most importantly, a computer (called Mother) that has been taking over the world in "With Folded Hands" fashion -- keeping people safe from themselves to an excessive degree. Oh, and the mob too. And a love interest for Cook. It's quite a strange and overwrought book. There are some neat ideas, such as the hypnads that mediate everyone's access to their senses, such that a decrepit city can appear glorious, and such that most people look beautiful. There is also a sense of moral ambiguity -- Cook, for example, is brought to realize that his super powers are being manipulated in potentially dangerous ways. But on the whole the story is really just too much of a mess to work. High could be interesting -- though he was never exactly good -- but I think this book rates as one of his lesser efforts. Here's a return to a subtheme of this series -- popular books for children. As with most children's books it didn't appear on any bestseller lists (and indeed there weren't any such lists when this book was published in 1891). It appears to have been quite popular, however. 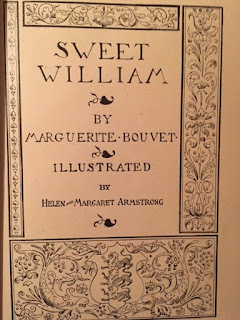 Despite her name, and the fact that Sweet William (as with many of her books) is set in France, Marguerite Bouvet was an American. That said, she was of French ancestry (both her parents came from distinguished French families, but they lost their fortune in the Civil War), and she was born in New Orleans, and she spent about 7 years of her childhood in France, living with her grandparents after her father's death. So she came by her interest in things French honestly enough! She was born in 1865 and died in 1915. She spent some time as a French teacher, but turned to writing. Most or all of her books were for children. 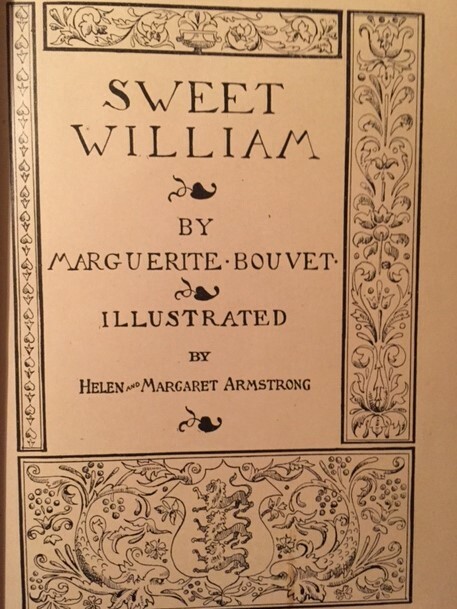 Sweet William was one of her earliest books, published in 1891, by the Chicago firm A. C. McClurg. 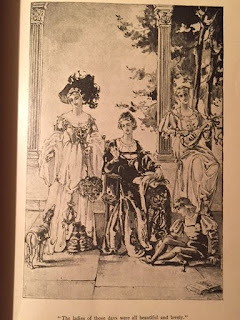 It was illustrated by Helen and Margaret Armstrong, a pair of sisters who were significant women illustrators of the time. (I like the illustrations quite a bit.) My copy has pasted-in labels on the inside front cover, reading: "To Stephney Roller on her 7th Birthday, From Pearl Sling[?]". 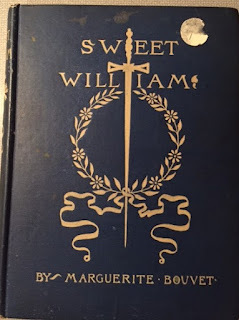 Sweet William is the story of a little boy who grows up isolated in a tower of the castle at Mont Saint Michel (called Mount Saint Michael in the book). William is put there by the evil Duke William. It seems Duke William of Normandy (not THE William of Normandy), a cruel man, went off to war alongside his much more popular brother. Both left pregnant young wives at home. William killed his brother on the field (even though both were fighting for France). On coming home, he found that both women had had their children, but William's wife died in childbirth. Furious, he orders the little son of his brother locked up in the tower. His own daughter is raised in the castle, but fortunately the cruel Duke is away most of the time, and in addition his sister-in-law is exiled back to her family. 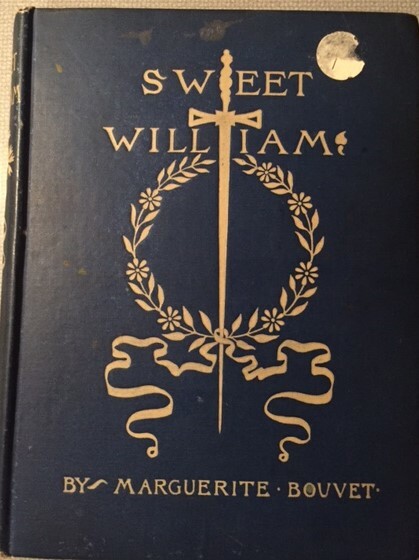 Despite his isolation, young William, soon called Sweet William, grows up a virtuous and happy child. His only companions are his nurse and an elderly manservant. Aged 6 or 7 or so, he spies his cousin Constance going off to hunt on her beloved horse -- and she sees him in the tower. Soon she has inveigled her servants to allow her to visit the tower, and she and William become close. You can probably guess the secret revelation. Which to be honest I found a bit anti-climactic, a bit disappointing. Of course the Duke is brought to a shocking revelation of his own injustice ... though his villainy has always been apparent, and (as the book makes clear) his eventual sort of repentance does him little credit. It is clear the William and Constance (though only 9 or so! and first cousins!) will marry (when they get older) and that Sweet William will become rightful Duke of Normandy in good time. The book is unrealistic, the plot a bit silly, and there is plenty of sanctimoniousness throughout. And the characters, especially the children, especially Sweet William, don't really make sense. Despite all that, it held my attention through its relatively short length (perhaps 36,000 words), and I can imagine it had some popularity at some time. I don't think it particularly worthy of revival, but I don't regret the time spent reading it. 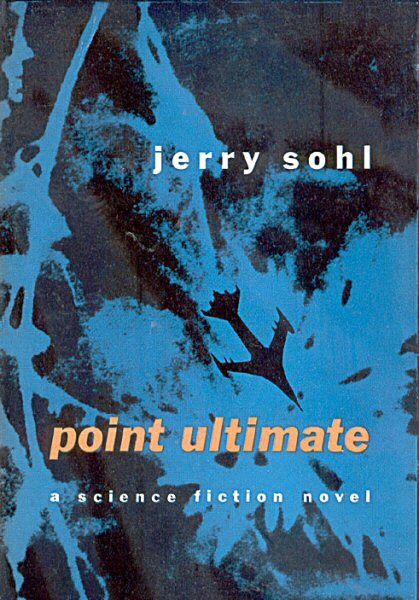 Jerry Sohl (1913-2002) was a journalist turned SF writer. He wrote about 14 novels and 16 short stories between 1952 and the mid-80s (with a couple of outlier shorts a bit later). He also had a fairly significant career as a TV writer for such series as The Twilight Zone, The Outer Limits, The Invaders, and the original Star Trek (he wrote "The Corbomite Maneuver"). Nothing he wrote was particularly memorable -- the Science Fiction Encyclopedia allows that he was "competent" and a "professional craftsman", but Gary Westfahl is much harsher on his TV contributions, and Damon Knight absolutely eviscerated the book at hand (Point Ultimate) in In Search of Wonder. To put the final nail in his coffin, my wife Mary Ann, a devotee of Star Trek: The Original Series, describes "The Corbomite Maneuver" as "not one of my favorite episodes". Still, his was a name I was sufficiently familiar with that I figured I ought to give him a try, and when I found a copy of Point Ultimate in an antique store for a dollar I thought "What the heck? ", and bought it. I didn't remember Knight's review -- it turns out Knight was right. Point Ultimate was published in 1955 by Rinehart and Company (and simultaneously in Canada by Clarke, Irwin). It arguably fits in two separate categories of James Nicoll's themed review series. James is currently doing "Red Menace" books (though he's looking for more "hidden Commies" than this book, in which they've already taken over), and back in 1999 or so, at rec.arts.sf.written, he did a series of books set at the turn of the millennium, and this book is set in 1999. The following will be full of spoilers for the book. The book opens with 26 year old Emmett Keyes planning to escape Spring Creek, IL (near Springfield) and somehow meet up with the resistance movement he is sure must exist somewhere. For it seems that in 1969, four years before Emmett was born, the Russians invaded the US (and the rest of the world), and took over without much of a fight, due to two factors: a shield they invented which stops any bombs reaching Soviet territory, and, more importantly, a plague that they have distributed all over the world. They alone hold the secret of immunity, and they give it out as booster shots that last a month, so that all their subject peoples must toe the line, and show up for their shots every month. Emmett has one secret in his favor: he's immune to the plague. So he heads out on his trek, and before you know it, he has blundered into a farm owned by a nasty Commie collaborator. The Commie tries to kill him, and Emmett, in self defense, kills the man instead. His wife turns out to be thrilled -- she hated her husband and all the commies, and she gives Emmett some money and a stun gun her husband had been issued, and sends him on his way. He soon blunders again into a group of suspicious people in the woods. They quickly subdue him, and take his gun, and they immediately know who he is. But they seem to be against the Commies -- and, more importantly, one of them is a delectable young woman who falls for Emmett immediately. He is quickly released -- without learning anything about the group -- but the girl, Ivy, suggests he try to find a nearby group of gypsies. But before Emmett reaches the gypsy camp, he blunders again (Emmett blunders a lot) and is captured by the local Communist director, Mr. Gniessen. Fortunately, Gniessen is desperate for human company -- it seems all his Soviet-provided servants are robots, and the only humans who live with him are his chef and his doctor. He is safe, however, because the house brain recognizes all the people on the estate via the bracelets they wear (one is immediately placed on Emmett), so escape is impossible. Emmett becomes Gniessen's massage therapist. Gniessen is a fat and dissipated man. 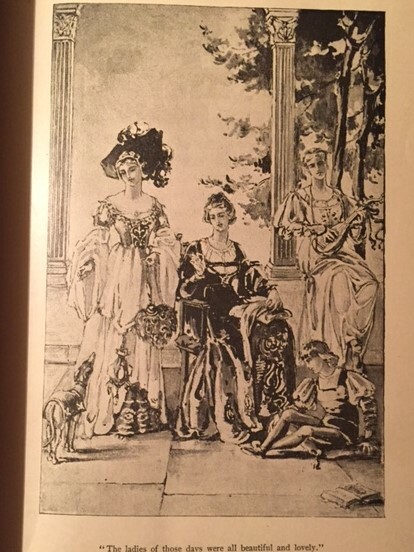 Emmett soon learns of his major recreation -- weekly orgies in which the prettiest of the local girls are brought in for the entertainment of the local Communist officials and trusted collaborators. (The girls are well compensated.) He also learns from the Doctor of an underground network of abortionists who help girls who get in trouble (the Communist regime strictly regulates births, for reasons which take a long time to come clear), and also he finds hints that some girls are sent somewhere special to have their babies -- somewhere from which they never return. Emmett's chance to escape comes by coincidence, when Gniessen's heart gives out, and Emmett can replace his own bracelet with Gniessen's. He gets away far enough to finally meet a gypsy caravan, and he soon finds to his shock that the magician's girl assistant is no one other than Ivy. After overcoming their suspicions he joins them, and is looking forward to meeting the leader of the resistance movement he had been sure existed, and to go to "Point Ultimate", their headquarters. But before this can happen the Communists track him down, and he is taken to New York to talk to one of the Commie leaders. But magically the resistance leaders desperately want him, so they manage to spring him, and he gets taken to Point Ultimate, where he learns the real secret ... The American scientists (many of them) managed to escape and hide, and they have colonized Mars, and also developed a way for 20% of the population to become immune to the plague, and they are slowly building a force based on Mars to return and destroy the Commie threat. And,look, here comes Ivy, who can't live without Emmett, so she will gladly take the 20% chance that she can become immune to the plague to join him on Mars. Bottom line -- a book that has been forgotten for good reason.